Use this session to get your players passing and moving dynamically, introducing new techniques as well as refining old tricks when it comes to passing the ball. Give your players the opportunity to learn in a pressure-free environment, developing their confidence and technical ability. 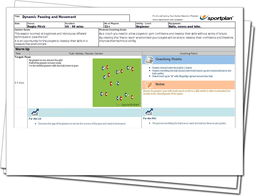 Use dynamic play to get your team ahead of the opposition! First of all, we start with a warm up to get your team ready and focused for the session ahead. Use the warm up to see where your player's technique is at already, making sure they pass the ball with both hands, as well as making sure they are ready to receive the pass with their hands up and moving into space. As we go through the session, work on the various different lengths of passing that can be used, allowing your team to pass freely without the fear of being tackled. Finish off with a fun game to see how your players have improved since the start of the season, where they'll be using a lot more dynamic movement and passing, ready to give the edge in their next match! Encourage communication between your players and increase your side's confidence.